Fifteen-year-old Alexandra Spencer's life was not supposed to turn out this way. She was not supposed to go on trial for a crime she did not commit. She was not supposed to be found guilty. And she was not supposed to be sent to Elder Grey Detention Centre, a place of horrors many don't survive. Shell-shocked and struggling to understand why she is no longer a member of the city's ruling family, Alexandra is torn from her privileged life by the churlish young guard, Will Metcalfe, and forced to trek for three weeks through deadly wilderness to her place of imprisonment. Her journey with Will is a constant battle for survival, where she is never sure who is the real enemy. It is also journey into the truth about the safe and lavish world from which she has been cast. Through Will, she learns of a mutant race called Drifters living in the wilderness who are being preyed upon by New Phoenix's guards—Drifter's blood being a life saving cure-all elixir for the city's inhabitants. When Will spoke, his voice was low, menacing, and far more terrifying than the blade he held to my neck. "I don't appreciate being woken in the middle of the night to chase a Princess from the City around the bush, because she wants to stretch her legs." He looked at me with disgust. "I should take you straight to Eton. It's what you deserve." I shrugged my shoulders. Frankly, I'd rather he took me to Eton. I felt safer with him—he seemed the kinder of the two. Will narrowed his eyes. "You have no idea. Eton's not the saint you think he is. You're just lucky it wasn't him that found you." "Lucky?" My voice returned at Will's insinuation. "I'm lucky to have a knife pointing at my throat?" I sounded far braver than I felt, and the annoyed look in Will's eyes as I spoke sent a shimmer of satisfaction through me. There was no need for him to know how petrified I was right now. "Be glad that's all it's doing." Something in his words didn't ring true. "You won't kill me, neither will Eton." Will raised an eyebrow as if considering, and a threatening smile grew on his lips. "True. But we don't have to kill you to make our point." The tip of his knife nicked my skin sending a trickle of blood dribbling down my neck. Hayley Barrett began writing in the aftermath of the devastating Christchurch earthquakes of 2010 and 2011 as a way of escaping from the ongoing terror of the natural disaster. Not totally happy with her efforts, in 2012 she commenced a novel writing course. Into Darkness, her first novel, is the result of the course and two years hard work. 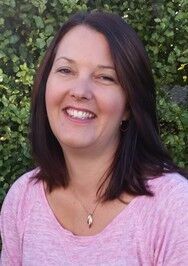 Hayley lives in Rolleston, ten minutes south of Christchurch, New Zealand, with her husband and three children. When she isn't driving her kids to their sports practices, games and other after school activities, she enjoys playing squash, relaxing in the sun and reading. Most days she wishes there were more hours available to spend writing. 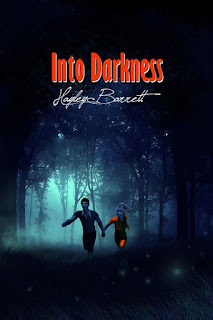 Did you enjoy writing Into Darkness? I loved every part of writing that book. I thought about it solidly for the two years it took to write, and I was constantly coming up with ideas to make it better. The sequel however (the book I'm currently working on) has been much harder to write. I think they are quite proud. My eleven year old is desperate to read Into Darkness but there is one scene which I don't really want him to read (it's not graphic, but as his parent, I don't think it's suitable), so I haven't let him…yet. The rest of my family have read it, including my Mum who doesn't really like to read, so that must mean something good! Ideas usually come to me as I write. I always start with a plan in mind, but often my characters have other ideas and the scene ends up going somewhere else entirely. Sometimes I write a scene then when I'm doing something else entirely I'll get a better idea and end up rewriting. Ha! Yes, all the time! I always hate my first draft, but I try to use what I can and rewrite the bits I don't like. When I first started writing, I thought everything I wrote was amazing…now it's the opposite. I've almost completed the sequel to Into Darkness, and I'm also very close to completing a novella told from the point of view of one of the minor characters from both books. Once those are done, I have plans to write something with a more historic feel to it – with any luck, I'll start on that prior to Christmas.